John’s interest in cooking began with his curiosity in his grandmother’s expansive garden, learning early about the importance of seasonality, flavor and balance. At age 14, John moved to South Korea for three years where he not only became fluent in Korean, but truly embraced Asian flavors, language and spirits. After nearly two decades running a successful law practice and firm in Manhattan, John decided to pursue his real passion-a new culinary career at the French Culinary Institute (FCI) in New York where he graduated first in his class. It was at FCI that John met Dave Arnold, a well-respected renegade of modernist cuisine. 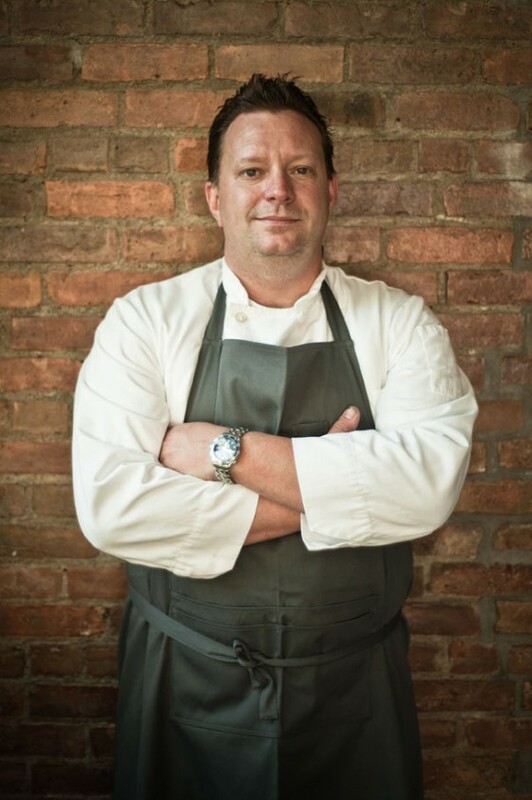 Dave encouraged John to stage at Chef Wylie Dufresne’s wd-50. After staging for several years, he and was offered the new position as part of Research and Development at wd-50 before leaving in October, 2011 to truly take his skills and craft to a new frontier. In 2010, John and Dianna (his wife) purchased a home in Columbia County, New York, in the heart of the Hudson Valley and bountiful farmland. Columbia County reminded them both of their childhood homes in Maryland and Pennsylvania. The Crimson Sparrow was bought in October, 2011 and opened in June, 2012. The Crimson Sparrow builds on all of John’s reverence and experience in cooking with Asian flavors utilizing French technique. The Crimson Sparrow’s Tasting Menu is a foray into all of these complex, rich and unexpected flavors. It changes approximately every two to three weeks, to reflect seasonality. In addition, some of the best elements of the seasonal menu can be sampled at the bar as part of the restaurant’s a la carte menu all of which have a true pact with the cellar and beverage program. The beverage program at The Crimson Sparrow was developed by John and features unique cocktails, and a formidable list of wine, sake and shochu. John also received certification as a Sake Adviser and Sommelier through the Sake School of America, which has been endorsed by The Sake Service Institute International, the largest organization of Sake Sommelier certification in Japan. John continues to study Asian cuisine and culture, staging in Tokyo as well as remaining engaged in the study of Sake. In the Winter of 2014, he staged with a Sushi Master in Tokyo and continues to infuse all that he has learned into the cuisine and experience at The Crimson Sparrow.